This nylon training halter features an Anti-Pull strap behind the ears across the horse's head that feeds down through the bottom of the halter which connects to your lead rope, so that when your horse pulls back pressure applies across the top of the head. This effective training device works by naturally applying directly to the poll area (behind the ears-crown strap area) of your horse. very good for horses who tend to loosen themselves. Works great on a horse that has learned to pull back. Worked ok until it broke. Seemed to work fine with Horse that pulled. Broke second time used - nylon held but ring broke. Perfect for training my young horse! I loved this for my young horse who needs to learn not to set back over every little thing! He is a strong horse and has broke several lead ropes from setting back. Not now! It has been a great halter! Strong enough to with stand him setting back when tied. Great training tool! The product is well made and the blue (I ordered) is beautiful. That said it is too small for my horse BUT he does have a GIANT head and I know I usually have to order XL/WB for him (so if you have a horse with a big noggin you will prob have the same issue). Also it really didn't seem to deter him from pulling back when it came to getting in the trailer but again perhaps that is because it wasn't properly fitting him. Oh well, I will keep it around in case one of my smaller horses decided to act up. Great quality product, i expected it to be kinda cheap for the price but I was very surprised and happy. Fits my small headed Arabian decently on the tightest setting (a bit big but not too bad), and would fit a TB on the biggest setting. My horse stands tied much better now, after hauling back on this once, he's decided that it's better just to stand (he was rescued and has always pulled back - dangerous, and I had been working on it with him for a long time, but this finally made it click). I highly recommend this halter! I got blue, very bright and pretty! A bit big for my mustang yearling now...but it looks like it will work well when I start teaching the colt to tie. These pull back halters are much more effective at teaching horses not to pull back than shipping halters because shipping halters are abrasive and tighten down on their poll, which makes removing it difficult because the horse becomes head shy, and doesn't want you near their poll and ears. They aren't triple ply nor do they have really nice, thick solid brass buckles, but I've never had one break since the piece that the rope is attached to doesn't attached to the halter itself - only the pull back strap. And since there are no pieces or buckles to break on the pull back strap, it's unbreakable. Horses won't sit back for long on this halter the way they do with a shipping halter! My horse had a problem with pulling back when I fit got him. He's on OTTB. Now, with his good boy halter, he doesn't act the fool anymore! Gentle yet firm pressure and he stops the nonsense! He evens stands for the farrier now without a fight. Does the trick and a huge time saver! I use these for training horses who go overboard with pulling back when tied. They also work great to teach the hard to handle horse forward motion on the lead and also curb rearing issues very quickly. It cuts down training time and gives you more leverage without having to use more effort. The only downside to this particular halter is there is no size option. It comes in medium only. It fits small horse heads and medium heads if you have a quarter horse type breed. If you have a horse with a long head like a thoroughbred type or boxy head like a mustang, they are too small. I wish they came in a size L.
Very good to have if you need help with training works great. Purchased this item for my long yearling who has started this bad habit of pulling back when tied because he figured out if he's in a regular web halter he could get loose and go have all sorts of fun. I am using this in conjunction with the tie ring. Halter is of good quality, a little tricky when you first use it to get it on, and would not recommend on a horse that has issues with their ears, at least not at first. My horse is fine with it and he seems to be doing much better at standing still. We have only used this halter once, but I found that in situations where my mule would have balked before, he just paused slightly with this halter. I kept walking and let the rope pull naturally, and the small amount of pressure to the poll seemed to be enough to convince him that he should move on. Good, conflict-free training aid.I rate the quality at 3 Stars because it's kind of awkward to put this halter on. It is difficult to sort out all the various straps, buckles and snaps. I think it might be easier if the neck rope part were a different color, so you would have a two-tone halter. I hope I'll eventually get used to it so it won't take so long to sort it out every time I put it on him. 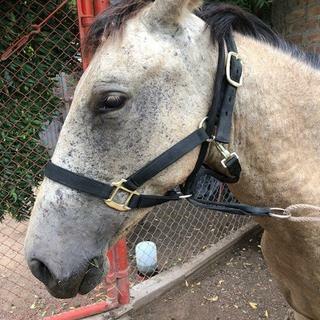 Otherwise, the quality of the materials is fine.The halter looks good and fits Rojo well. He is an average sized mule about 13HH with an average sized head. My naughty TB cross is responding very well to this halter. Size is great for a standard size horse. Someone recommended this type of halter for my young horse who won't tie. Results were immediate. He was flying backwards, breaking everything. He pulled back once in this halter and not again! Snug on my shireXthoroughbred. like the concept, need a smaller size! Contrary to most reviewers, I found this halter to be too BIG for my quarter horse. She is only about 14.3 and does have a smallish head, I do sometimes have to buy cob or arab size bridles / halters but I would think this should fit your typical 15+ to 16 hand horse fine. nice product - BUT READ REVIEWS FIRST-SIZE! I have used homemade 'neck ropes' for years and was excited to find a finished product.However I didn't read the reviews first and when I got it, they were WAY TOO SMALL for a 15.1 hand horse. There is only a color selection, not a size selection, and unless you are training a yearling or two year old, or have an Arab or small breed, it will not fit a standard size horse let alone a large one. It was to big for my two year old horse .A med. is for a horse 800 to 1100 pounds.the reviews i read did not fit this product. This product is made for a adult horse. Bought 2 about a year ago. Both are still in good condition. They fit well and I would recommend them for those horses who like to pull back. One of mine doesn't do that anymore!! Got a horse off the track and he started this pulling back when tied stuff, can't let him get away with it so decided to try this halter. The reviews were good so we will see if it works for the big boy! Hopefully this will help my horse that hates being tied stand still better. Will it fit a yearling? Does this halter fits size Full , My bridle & halter size is full ?? BEST ANSWER: Size: Average Horse 800-1100 lbs. will this fit a donkey around 300# ?